This concert may well have been the feel-good event of the year. The premise is irresistible: attractive banjo-toting couple from Nashville, young heirs to the bluegrass and old-time traditions, flush with joy about their new baby boy. She plays claw style (fingernails push); he plays bluegrass (fingernails pull). She is effusive; he is dry. Hearts are rarely stolen faster. 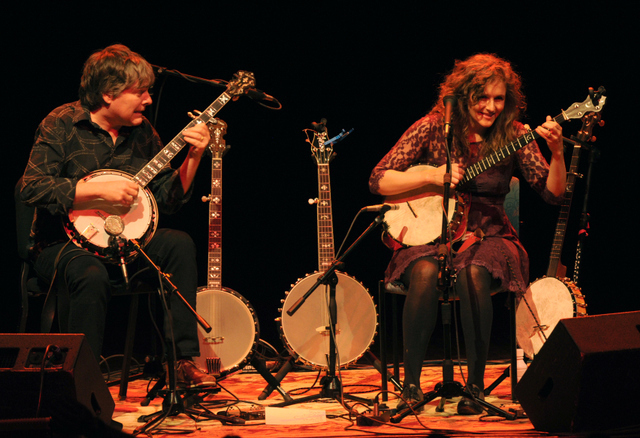 Yet, there’s nothing provincial here, if Béla Fleck and Abigail Washburn are indicators of the direction things are heading. It’s not that the package is inaccurate — this concert included hearty nods to the past, like tunes from Washington Phillips and Doc Watson; it’s the immensity of the “yes, and . . .” factor. And judging from the near-sellout Campbell Hall crowd, plenty of locals are clued in to this face of 21st century Americana, which is really trans-American and trans-genre. Fleck has nominations in more musical categories than anyone in Grammy history. His banjo frequently leaves the staid modal basins of folk to forage the rough harmonic borderlands of jazz and new music. He has collaborated in composing two symphonic concertos and recently wrote his own for banjo and orchestra, The Imposter. And then there is the year he went to Mali, The Gambia, Uganda, and Tanzania to look for the roots of his instrument, jamming with African folk musicians for his Throw Down Your Heart project. Washburn has her own international leanings — fluent in Chinese and the first-ever American musician to enjoy a U.S. government-paid tour of Tibet. All of these threads were braided into a generous set that included Chinese vocals by Washburn and songs from her City of Refuge album, an unaccompanied excerpt from Fleck’s concerto and new tunes inspired by parenthood. The evening was sealed with the hymn “His Eye is on the Sparrow,” dedicated to Washburn’s grandmother.